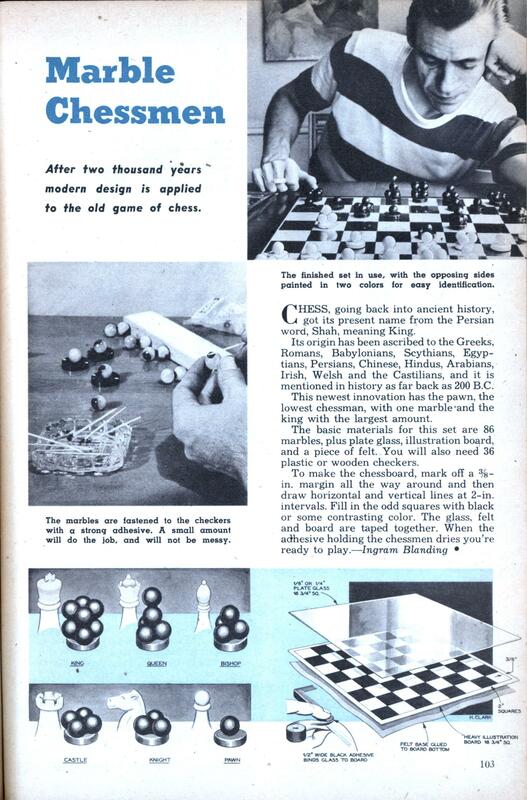 After two thousand years modern design is applied to the old game of chess. CHESS, going back into ancient history, got its present name from the Persian word, Shah, meaning King. Its origin has been ascribed to the Greeks, Romans, Babylonians, Scythians, Egyptians, Persians, Chinese, Hindus, Arabians, Irish, Welsh and the Castilians, and it is mentioned in history as far back as 200 B.C. This newest innovation has the pawn, the lowest chessman, with one marble *and the king with the largest amount. The basic materials for this set are 86 marbles, plus plate glass, illustration board, and a piece of felt. You will also need 36 plastic or wooden checkers.